This edited collection examines human resource management in organizations other than those that are set up to make a profit. Covering human resource management in a number of different kinds of mission-driven organizations, the book explores organizations in sectors and industries such as the governmental and intergovernmental public sector, volunteer organizations and charities, religious organizations, cultural organizations, sports organizations and B-corporations. Recognizing the reality of management practice in the (many small) organizations covered by the book, the chapters deal with the way that people are actually managed whether or not there is an HRM department present. Students of business management and human resource management will find this book invaluable as a source of knowledge on not for profit organizations, as many of the chapters include detailed examples and case studies. 1. 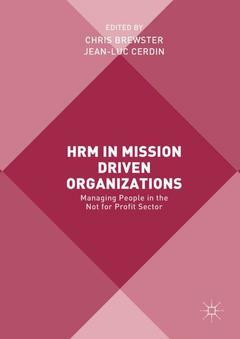 The Management of People in Mission Driven Organizations; Chris Brewster and Jean-Luc Cerdin.- 2. People Management in the Public Sector; Eva Knies and Peter Leisink.- 3. People Management in Volunteer Organizations and Charities; Kerstin Alfes.- 4. HRM in the International Organizations; Chris Brewster, Paul Boselie and Claudia Purpura.- 5. Understanding HRM in Religious Organizations: HRM Practices Within Two Churches of the Protestant Federation of France; Lovanirina Ramboarison-Lalao.- 6. HRM in Cultural Institutions; Dino Ruta and Isabella Sala.- 7. HRM in Sport Organizations; Dino Ruta and Isabella Sala.- 8. People Management in Social Enterprises: B Corporations; Anne-Laure Winkler and Florencio Portocarrero.- 9. Talent Management in Mission Driven Organizations; Jean-Luc Cerdin, Kushal Sharma, Ibraiz Tarique and Claudia Purpura.- 10. Management of People in Mission Driven Organizations: Current State and Future Directions; Jean-Luc Cerdin, Chris Brewster and Kushal Sharma. Chris Brewster is Professor of International Human Resource Management at Henley Business School, University of Reading, UK; Radboud University, Nijmegen, the Netherlands; the University of Vaasa, Finland; and ISCTE- Instituto Universitário de Lisboa , Lisbon, Portugal. He has substantial experience as a practitioner and gained his doctorate from the LSE before becoming an academic. Chris researches in the field of international and comparative HRM, and has published more than thirty books as editor or author and over two hundred articles. In 2006 Chris was awarded an Honorary Doctorate by the University of Vaasa, Finland. Jean-Luc Cerdin is Professor of Human Resource Management at ESSEC Business School in France. He gained a doctorate from Toulouse University and an MSc from the LSE. He worked as a practitioner in Human Resource Management before becoming an academic. He has served as Visiting Professor at Rutgers University and University of Missouri St-Louis, and as Visiting Scholar at the Wharton School, University of Pennsylvania, USA. He researches, publishes and consults in three primary areas: International Human Resource Management; Expatriation Management; and Career Management.